Are you looking for a Sunday sit-down dinner taste without the hours of prep? You can find this yummy casserole in–you guessed it– Gooseberry Patch’s Big Book of Home Cooking , due out the 20th of this month… (Psst… you can pre-order it on Amazon for $20 here or enter to win it here). First up, melt a stick of butter or margarine in a skillet. Now grab your celery and wash it up. Give a stick to the alien hanging out in your kitchen pretending to be your child per her request?!? And chop up 1 cup of celery. Now if your alien won’t eat up the rest of that celery, chop it up and freeze it up too. By now, your butter should be melted, so toss in your celery and onion and cook them up until they are nice and tender. Pour those yummy veggies into a a mixing bowl. Sprinkle on a little ground sage. Enter my secret weapon. You can cook up 5 chicken breasts and chop them up or, grab a bag of these precooked chicken strips and chop them up and toss them in. I added 2 cups. Now mix it up and pop into a casserole dish. yummmmmmmmo! This sounds great and super easy. I think that I will save this one for one of my long work days when I am starving but don’t feel like cooking. That is one cute alien! Yum! This is right up my ally..comfort food at it’s finest! Has anybody tried to do this in the Crock Pot? It looks delish but the 1 hour of cooking time is a deal breaker for me. I am a Crock Pot fiend because I just don’t get home early enough to spend that much time waiting for food to cook. Thanks! I made this and it was a huge hit. Every last crumb got eaten. I thought it was a little salty between the cream of chicken soup and the jar of gravy. But so yummy! Will make again. 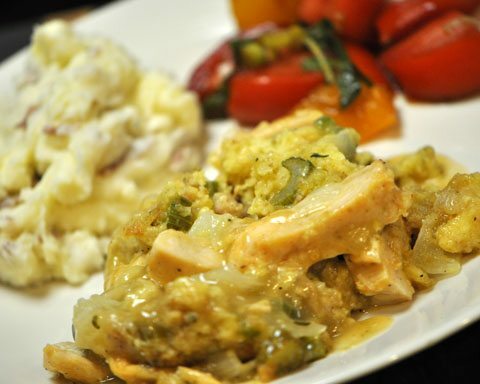 Just what I was looking for….I am having a craving for early Thanksgiving comfort food. Definitely making this in the next few days! Thank you for the recipe. My husband and I both enjoyed this, so it’s a keeper! The gravy on top made it perfect. I served it with some cranberry sauce ,easy and delicious meal.